Can Amara come out and play? Things have certainly changed since I was a little girl. They’ve changed since my little girl was a little girl. Long gone are the days of asking Mom “can I go out and play?” Gone are the days of having to be home before the street lights come on. Playing with a friend has now become an event. This event is called a Playdate. Yesterday was my first real playdate experience. Now you may think that I am biased but my daughter is amazing! 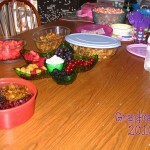 She created a feast for the Moms and girls that were invited to this playdate. But she does that kind of thing a lot. She cooks a wonderful home cooked dinner for her family every week night and she bakes something almost every day. She really is amazing and I am very proud of her. 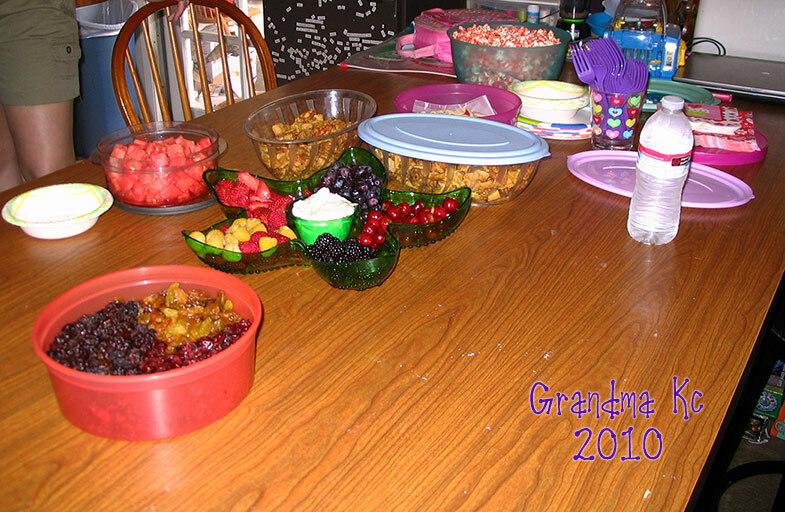 The feast she served for the playdate included 3 kinds of dried raisins; fresh cut watermelon; red and yellow raspberries, blackberries, strawberries, blueberries and cherries served with a marshmallow fluff and cream cheese dip. She made strawberry filled cookies, caramel Chex Mix and jello popcorn. Do you see why I brag about her? I only stayed for a short time but there was immense giggling going on and I got to play the Evil Witch for a little while. When I left the girls were munching and watching a Barbie movie. Things may have gotten a little crazy after I left! 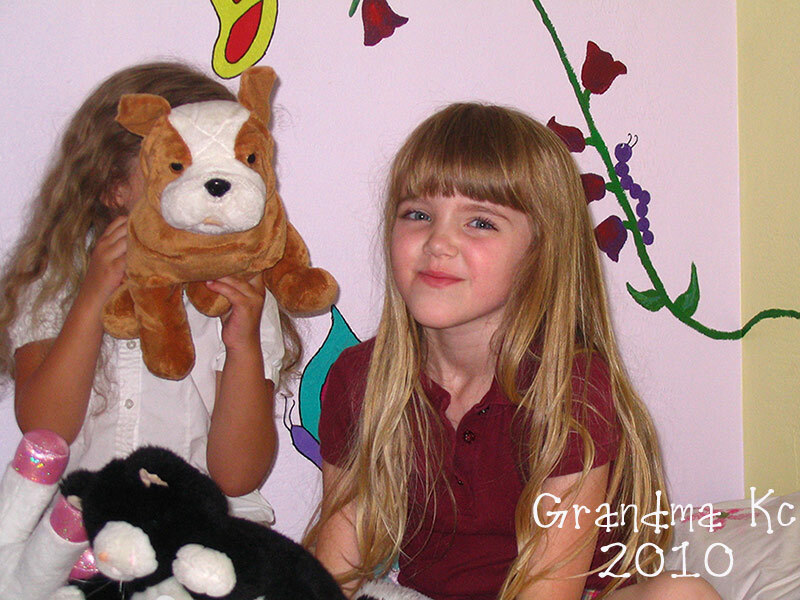 This memory was posted in Indoor Fun, Parent, Relatives and tagged Amara, Barbie, games, Mommy, movies on May 30, 2010 by Grandma Kc. I also have no experience with these ‘play dates’! Yikes! I feel so old! I loved your descriptions of it all! And the spread Jenna put out sounds delicious! I still want to live next door to her so I can help her taste test all the yummy stuff she makes!! What a fun post! Bias, by the way, is a good thing. Especially when it comes to your own people. I’m tremendously biased for all my kids and grandkids. 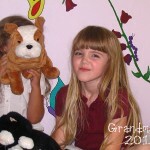 I just say, all bias aside, my daughter(s) is amazing! And your daughter, Jenna, obviously is! Can I come over next time? P.S. When Dani had a party and wanted to paint toenails, the girls were put out on the patio, over old towels. They all sat in a circle facing in and painted each others’. They were 10, I think, though, not 6. I have pictures — it was a hoot! I hope you’ll feature Jenna some more. I’d like to add her to my favorite moms list, right along side my own girls. 🙂 Shall we have coffee, Kc? I’m so glad you enjoyed my post! I am happy to announce that after much nagging and nudging Jenna has started her own blog! I take credit for having been the number one nagger of this idea! It is only 3 days old but I think it is pretty awesome! http://twirlgirl23.com/random/. Grandma, can you come out and play? Cute post. I can only imagine 6 year olds and fingernail polish. Not a good combination. I don’t know how to email you from your blog, but if you’ve got an inkling, I’d love to chat over email. Jenna really does know how to keep a “gaggle” of little girls happy! Good for her! This is probably why Amara has such a lovely little group of friends that she may well maintain for the rest of her life. I do remember, and regret the demise of, the days kids could just run free in the neighborhood. We used to roller skate and bike around the block until we came home at dark, exhausted. No “weirdoes” to fear like there are now, sad to say. Playdates are probably the safest way to go and lucky kids who have moms and grandmas who know how to make those special! 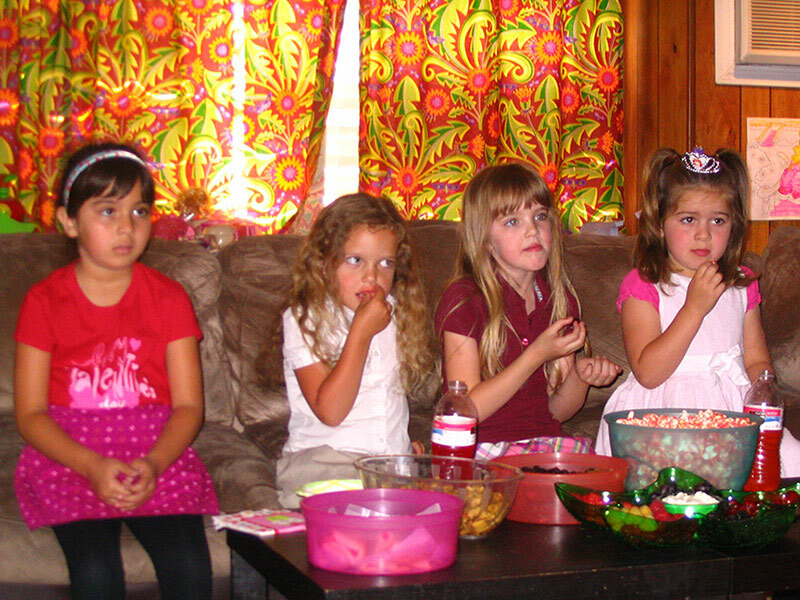 I can’t imagine keeping six little girls happy for an afternoon. I never had daughters, and I am challenged when there are two in a room! Wow it sounds as if your daughter is amazing! Thats quite a feast, and yes, it may have gotten a little out of hand after you left. I still have green nail polish on my kitchen counter from over a yr ago 🙂 Thanks for linking!